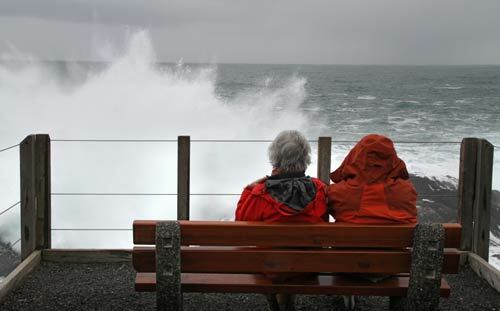 March 2011, people get very wet but escape injury when unusually large waves strike Ucluelet's lighthouse during hurricane force storm surges. Trails and beaches had to be closed. Escape to the ever-green coastal rainforest of the Pacific Rim this winter! If your timing is good you may witness a wild Pacific storm. 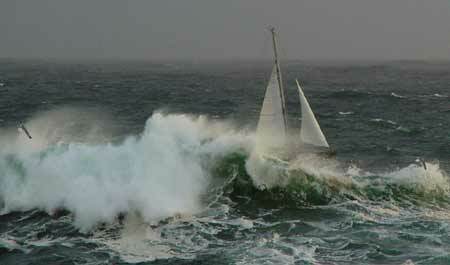 Nothing is more exhilarating than the fury of the wind, rain and waves during a “sou’wester”. The raw power of nature has become a fascinating draw for visitors and locals alike when the pressure drops and the winds howl into a gale force exceeding 70km an hour. 3 - 4 metre high waves pound the beaches and shake the headlands sending frothy sea spray high into the air. The Long Beach region gets over 4 meters of rain a year, the majority of which falls with great intensity during these winter storms. The biggest waves are often seen after the winds abate. Kwisitis Visitor Centre, in Pacific Rim National Park, offers a safe view and shelter from the rain. Waves can be high any time of year, but are most common from November to April. Trails such as the Wild Pacific Trail in Ucluelet, the Kwisitis Centre in Pacific Rim National Park, and coastal resorts/restaurants offer safe viewing points. STAY ON THE TRAILS waves are faster and stronger than any mortal! Bare rocks along the coastline are swept clean of plants by the powerful surf. It is not safe to walk on the rocks or on beaches during storms, even on calm days waves can surprise you. Waves break more dramatically on rocky headlands or reefs. SAFE viewing spots are the Ucluelet lighthouse and countless coastal over-looks along the trail. The trail will be closed in extreme winds due to risk of trees falling. Ocean-front resorts and restaurants also offer cozy viewing no matter how wild the storms may grow. Waves break more dramatically on rocky headlands or reefs. Avoid beaches and rocks at this time, waves are faster and stronger than any mortal! If storm watching (or surfing) is your objective, this Wave Model Website will predict the height of waves up to a week in advance. Mild temperatures can be expected year-round. It is very unusual to experience extreme cold or snow on the coastline, but snow is common inland, especially on the mountains. Highway 4 crosses a scenic mountain pass that can become slippery during heavy snow. Check this web cam for current road conditions. Good winter tires or chains are required during winter months. Estimated times depending on road conditions. Distances are short, but the road through mountains should be enjoyed slowly. Driving times to Tofino-Ucluelet junction. CLICK HERE for more information on travel to the west coast. Coastal weather patterns can change very rapidly on the Wild West Coast, usually to dramatic effect. Even in the rain the charms of rainforests and coastal vistas are a memorable experience.